It's now cool to be a programmer again. But the reasons for our renewed interest in the lives of computer whizzes go deeper than The Social Network. The movie has undoubtedly fueled a media reexamination of the programming life. 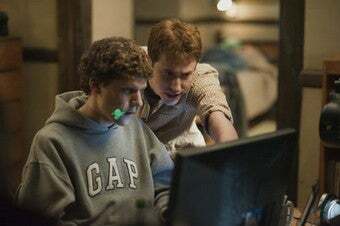 At the Times, Joe Nocera praises The Social Network's portrayal of the "obsessional quality" of the young tech entrepreneur. Jenna Wortham, also of the Times, talked to real young startup employees about the film — one, Amanda Peyton, said it "hit on the founder mentality" in which "you don't do anything else. You wake up in the morning, go to your computer, work until you pass out." And when the Observer's Leon Neyfakh visited a programming competition put on by HackNY last week, Sorkin's film inevitably came up. Said co-organizer Akiva Bamberger, "When you watch The Social Network, when you see that movie, you see someone who's actually very creative and just using this as a medium to express creativity, just like other people use writing and art." Neyfakh further paraphrases, "If working in journalism was like going to work as a technologist for a bank, he explained, then being the kind of hacker who would come to a hack-a-thon was like being a novelist or a poet." There's an air of badassery to some of these portrayals (one hacker told Neyfakh he was listening to "Trance music. Constant trance all night"), but most programmers agree that Sorkin's version of their lives as a nonstop wild party is pretty ridiculous. Peyton says, "Over the summer we lived down the street from the Facebook offices, and our house was pretty much like that — minus the drugs and girls." I also spoke to a friend who's a programmer in Silicon Valley — "to be frank," he said bluntly, "that was just a movie." He added, "I don't know of any situations where people are sitting around with cute girls in bikinis and taking bong hits while other people are coding." Hollywood seems to have a limited number of ways of signifying Cool (Half-naked ladies! Drugs! Bottle service!). But The Social Network may have resonated with viewers — and journalists — less because of depictions of some notional Silicon Valley party scene (or its equally inaccurate portrayals of Harvard and Stanford) than because it's actually an extremely exciting time to be a programmer and to learn about programmers. My Silicon Valley source explains that with Facebook and smartphones, we're now living in a time when "people are able to make not only huge amounts of money, but also huge amounts of impact in people's day-to-day life" by writing an app. There's a big difference between knowing that your software is used by, say, a large corporation's payroll department, and actually seeing people on the street use your app every day. The founder of Foursquare tells the Times, "It's hard to describe what it's like the first time you see people using your product. [...] We're getting into a similar place where people are getting excited about us the way they were getting excited about Facebook." And that excitement is contagious — it's easy for people to get interested in the stories of things they use all the time. Especially if they use those things for fun or to keep in touch — says my friend, "the world is changing in very fundamental ways because it's very social now." Maybe being a programmer today is a little bit like being a novelist or a poet — if you hit it big, you have the potential to define the spirit of the times, and to influence how people see themselves, their loved ones, and their friends. And if you're lucky, maybe someone will make a movie about you.